Want to know what’s great about the Vans Encore snowboard boots and what’s not so good about these boots. 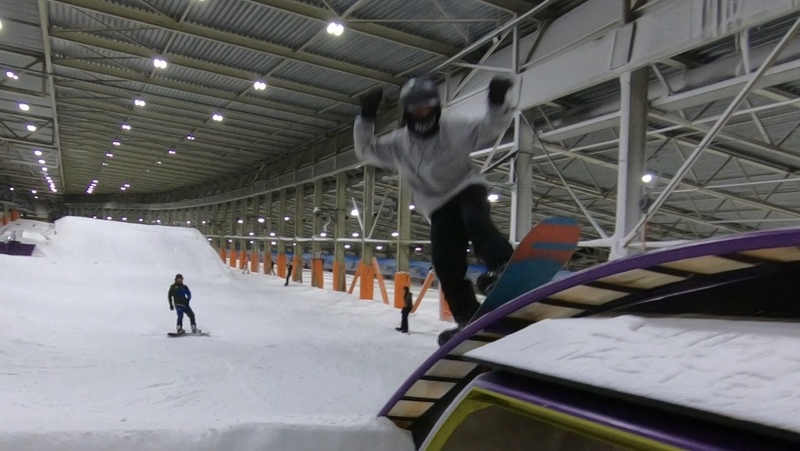 Well take a ride with Ollie, our snowboard ambassador, as he explains how they felt, smelt and dealt after he wore them for the first time to ride ‘park’ for a three-day session. Buying snowboard boots for riders of my age (12) is pretty difficult. You’re in that ‘in between’ size where youth boots are too small and men’s boots are too big…. aarrhh! This means that the range of snowboard boot options is pretty limited; and considering women’s boots becomes a necessity. I’m measured as a 4.5 (UK size) and I’ll explain what that meant for the Vans Encore later on. Purpose made kids snowboard boots are not an option for me anymore and if you’re in this situation, relax and read on because there are boots out there that will fit your feet and your style. These are super comfy boots straight out of the box (see above) with an easy to use inner web harness and outer BOA system. They are lightweight and responsive and, because they’re Vans, look totally sick. They are at the upper end in terms of price but they’re packed full of tech that makes them a good buy. They do fit a little small so although I am measured as a UK size 4.5, had to buy the UK size 7 (US 9.5) even the UK 6 was too small! So would always suggest visiting a store and boot fitting specialist. The classic Vans styling makes these boots look super sick. Kind of what you’d expect from such a great street style brand. These boots are very snug and comfortably tight. Compared to other boots I’ve had in the past, these ones definitely feel better when I’m on my snowboard and when I’m walking about off the slope. They felt great straight out of the box (see above) as they were really comfy and weren’t stiff at all. I rode with them for three days straight away with no pinching or cramping and they are pretty lightweight too. I did feel the seam from the inner digging into my toe a bit, but this wasn’t that bad and didn’t make it uncomfortable. These boots never come loose at all and provide a lot of structure for your feet. Based on all the factors of comfort, I’d rate them as a 5 out of 5! One of the problem areas for snowboard boots is how they transfer the movement of your feet through your bindings and into the board. The soft to medium flex of the Vans Encore make that feeling just right. I felt that my feet were connected very well with my snowboard and this made turn initiation and putting the power down feel just right. They have just the right amount of flex to allow you to jib and ride freestyle with good movement and feel. The BOA fastening system is by far the easiest and tightest system out there. Once I’ve done them up, there is absolutely no heel movement and they hold feet really well. The inner is a standard draw-string system that makes it simple to fasten comfortably tight. Based on all the performance factors, I’d rate them as a 4 out of 5. The classic Vans styling makes these boots look super sick. Kind of what you’d expect from such a great street style brand. The simple black and white colours of my boots go together really but I didn’t like blue and yellow on the inner draw-string. I think these straps would be better off being white or black to match the rest of the boot. Based on all the style factors, I’d rate them as a 4 out of 5. Overall, I’d rate the Vans Women’s Encore snowboard boots as a 4.5 out of 5 and I’d definitely recommend these boots for young riders. They are pretty rad! I’ve rated the boots in different aspects so I’ll take the best and worst factors from each area. Since 1977, Burton have been industry leaders in the world of snowboarding producing brand new technology which has revolutionised the way people snowboard and how they can progress in their snowboarding. Having spent the morning listening to how Burton are still working on their designs and new technology it didn’t take me long to realise that this company truly love snowboarding and are passionate about what they do and how they can share that passion all over the hill. Looking at the new Burton range you can see that they’ve gone to great lengths to accommodate every rider on the mountain from beginners to guys that shred hard from first lift to last call. The new “CLASH” is the perfect way to discover the freedom of snowboarding and form a solid grounding for your newly formed love of the sport. With its new V-rocker and extruded base this board will allow you to create a solid, but forgiving platform so that you can learn to link your turns without having to worry about catching an edge. By giving this board a beveled edge Burton have produced a product that is a lot softer and easier to use as a ‘newby’ to the sport. Burton have added a new type of technology they call “CRUISE CONTROL” which allows the board to track on the hill instead of sliding about making the rise of this board very forgiving for anyone just starting to establish a grounding. By making this board directional with a longer,wider nose and a tapered tail it will naturally make the board float across the snow. This unique board shape makes the ride all the more enjoyable and comfortable while making it easier to find the sweet spot where all the components come together. If you’re looking for a board that will help you to progress from that late beginner stage all the way through intermediate up to advance, trick level, look no further than the “PROCESS”. This is Burton’s best selling board. With its “Flying V” board style and its “twin twin” architecture, this board is perfect for those guys starting to learn 180s and 360s as it can be ridden switch without a problem. Burton have designed the ‘Process’ board so that even beginners don’t struggle with the basics by incorporating their new ‘Frostbite’ technology. ‘Frostbite’ technology means that the edge of the top sheet is slightly inset from the edge of the base ensuring that the board is more forgiving in the turns and the risk of catching an edge is eliminated. By manufacturing the top sheet this way they have managed to move the edge of the board back, meaning that the board can be put on more of an angle before the edges catch and a turn is initiated. These alterations were made as a result of the boards origins. Designed in Vermont,USA, an area known for its powder and deep snow conditions, Burton altered the ‘Process’ board accordingly. By adding a scooped tip and tail, the board has more float and flow through the powder and deep snow, and seamlessly flows over the top of the powder below. 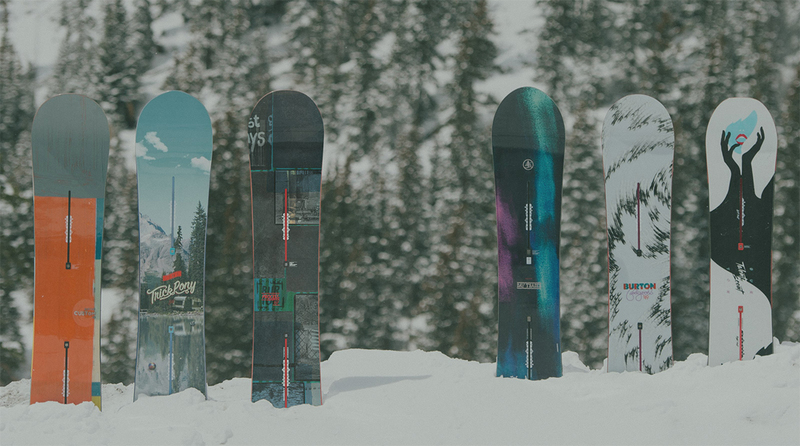 The ‘Process’ board also has their ‘SQUEEZEBOX’ technology which is their patent pending technology, specifically created to allow for more pop and performance in the park and backcountry. To create this performance and pop, Burton manufactured this product with differing core thickness’. By producing a product this way it allows the rider to ‘energise’ a specific part of the board and create a springboard effect on the board. Further, this added technology makes the board a lot stiffer and more responsive enabling it to react to whatever the rider tells it to do; the board becomes an extension of your body. When it comes to Burton’s top end Flagship boards the ‘Custom’ is where the pinnacle of technology and performance meet. Dependant on what sort of riding you will be doing there are two board style options available for this all mountain charger: The ‘Flying V’ or the ‘Camber’. Both boards are designed with a sintered WFO base which will allow the board to soak up all the wax and be able to retain that wax which makes this board ideal if you are heading out into the back country and re-waxing is not an option. The ‘Custom’ has been designed will a full body carbon highlights system, From tip to tail the board has been covered in a matt of carbon strings. Burton are unique in the market by layering the carbon highlights on a 45 degree angle across the board. By doing this it allows any surface pressure from the rider to be spread from the bindings out to the edges and down the board, making the board stiffer and more responsive. This carbon string system also adds a lot of torsional strength and rigidity to the board. Having a comfortable boot is probably the most important thing on the mountain and this years Burtons boots are certainly comfortable. With their practicality, comfort and supreme performance Burton have left the rest of the market on the beginner slope while they go and shred the powder. With their new 1-1 design feature of all Burtons boots they fit like a glove. This 1-1 technology means that the liner of the boot is the exact same size as the shell or outer layer of the boot ensuring that the boot is more responsive to any adjustments or movements from the rider. The 1-1 system also means that, unlike conventional boots, there is zero slide between the liner and the outer boot. Burton have been working really hard to make some of the most comfortable boots on the market. All of the Burton boots this season have been designed with a ‘total comfort’ construction and ‘total warmth’ construction. Burton have added extra padding and sections to the boots in specific places to really hold the riders foot into the correct position which makes shredding super comfortable! The total warmth technology is a new development from Burton and the ‘Sleeping Bag’ technology has been added to all of Burtons boots. This new technology is a layer of reflective material that sits just under the inner sole of the boot, so as your foot heats up, the heat doesn’t get wasted and escape from the boot but is stored up and projected back into the boot. What this means is that on those really cold days when all your friends are saying their feet are cold, your ready to send it again. 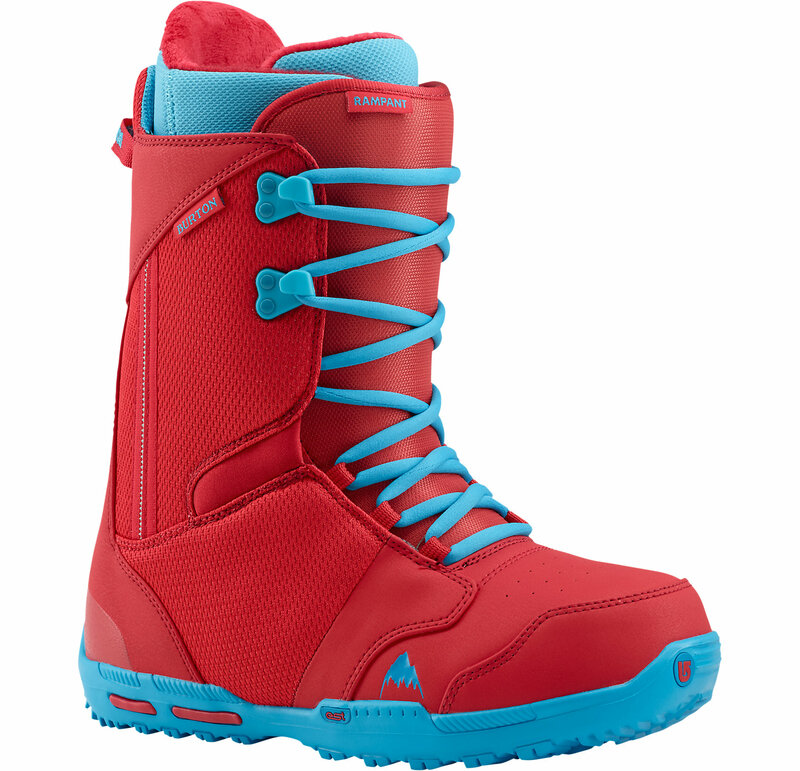 The Burton Rampant snowboard boot in red and blue. For a boot that will do it all Burton’s Rampant is the ideal boot. With its lace or speed string options, total warmth and total comfort design this is a great boot that will give you ultimate support and comfort all over the mountain. 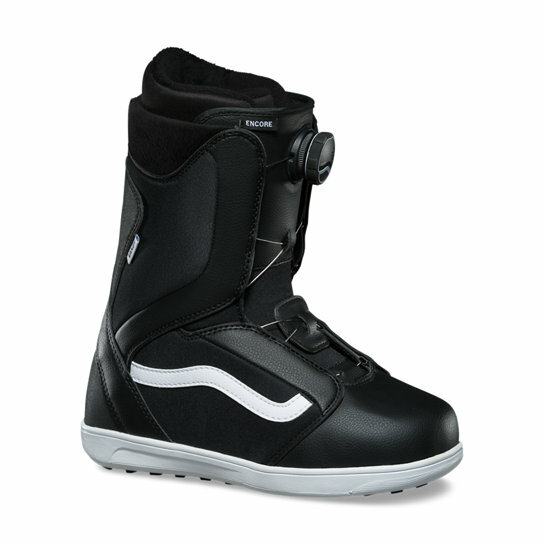 With its added technology of “carbon stringer” technology across the ankle section, and the “Cross-bone” cuff and power up tongue this boot is really setting the benchmark in technology and fashion out on the slopes. The binding is the connection between rider and board, the middle man of snowboarding, so having something that you can rely on to perform day after day is essential. This is where Burton boots come in to their own with a series of bindings that offer everything you’ll want on the hill. With its range of bindings Burton have really tried to reach out to every rider on the mountain. With the option of EST bindings or “disk” bindings, Burton have made their products available to everyone, whether you have a board with a binding channel or separate fixings the Burton bindings are still going to be a favourite in your search for the perfect binding. Starting off with the “Mission”, this is Burtons go to binding from beginners to shredders. 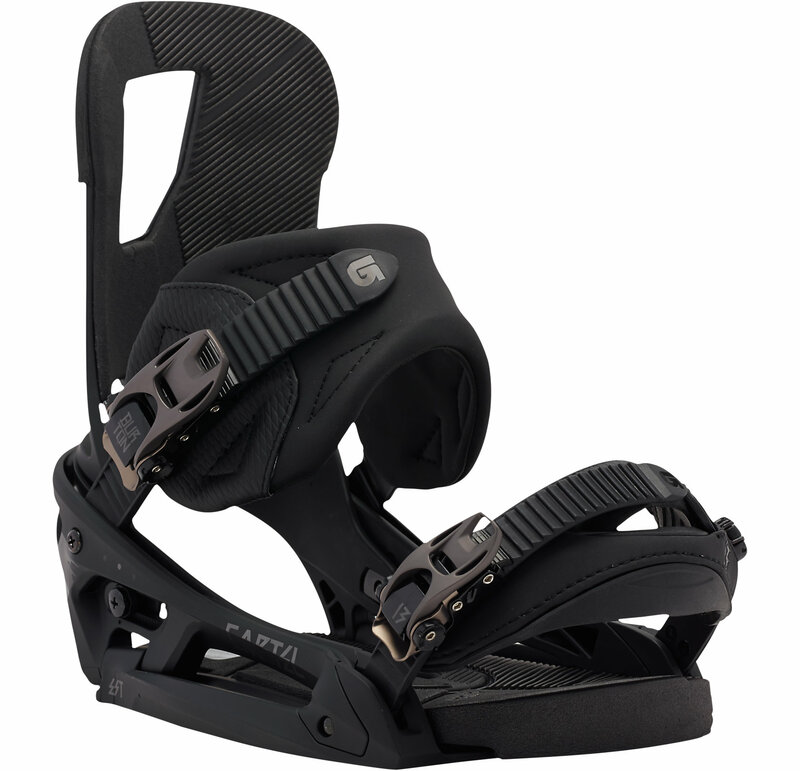 With its polyurethane high back and gel heel this binding is going to give you that immediate response and support that you’re going to need to push your riding into the next chute and up the next chairlift. It is a binding that with its 0 degree back plate and removed base plate will give you great feedback from the board and also present a really solid and reliable platform to direct the board from. The Burton Cartel EST snowboard binding in black. If your looking for a binding that is a little bit higher end and that will give you the professional feel and ride that you want, the Cartel is Burton’s premier binding, with a 90% flex in the back plate and B3 heat padding this binding will really make your riding feel like its being to the next level. The Cartel is very much a tailored binding that offers a stiffer ride style and a higher end quicker response. Not only is the Cartel a great riding binding but it is aesthetically pleasing to look at as well, with its wider straps and great colour scheme the Cartel is defiantly the binding of choice this season. Whatever your snowboarding needs; you can buy Burton snowboarding equipment from Tallington Lakes Pro Shop – make it yours! The Best Snowboard Boot Ever!